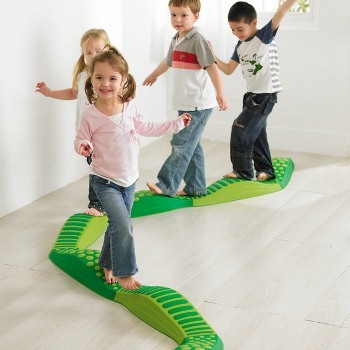 Create a fun sensory and balance activity with the 8 Piece Weplay Wavy Tactile Path Balance Beams. 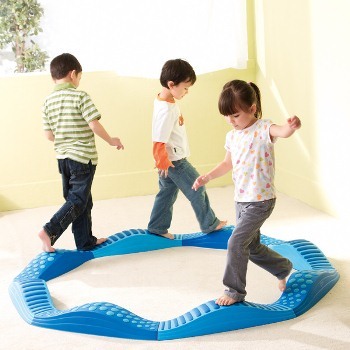 Kids will love walking on this wavy tactile path and play their imaginative games on them. 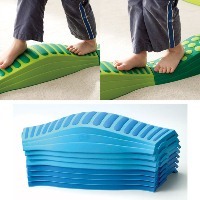 This innovative kids toy is built to offer the perfect tactile sensory intensity and an ergonomic design so it fits nicely against the arch of a child's foot. 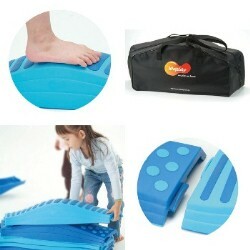 The path takes the idea of a balance bean to a new level by creating a series of hills and valleys. The patterns and the width of the board are designed to offer the most suitable tactile sensory intensity for the human body as well as the most realistic "nature" experience for children. The Wavy Tactile Path Set can be arranged into curvy or linear patterns to provide users with multiple ways of playing. This can help stimulate motor planning by allowing children to experience a variety of configurations and you can even allow them to create their own improving imagination and planning skills. The slight slopes on the 4 sides of the board not only offer balance control for the front and back, but also stimulate the left and right balance. Help children adapt to new environment through games. Help children cultivate spatial concepts through arranging and constructing.